If this is your first deposit, the minimum amount to transfer is S$500 and subsequent deposits can be of any amount. We do recommend maintaining a balance of at least $3,000 to ensure sufficient funds to invest in our loan volumes. The escrow account details can be found on the Deposit page, which you can access if you click on the Funding Societies logo on the top of the webpage. There will be a drop down navigation menu as shown in the picture below. 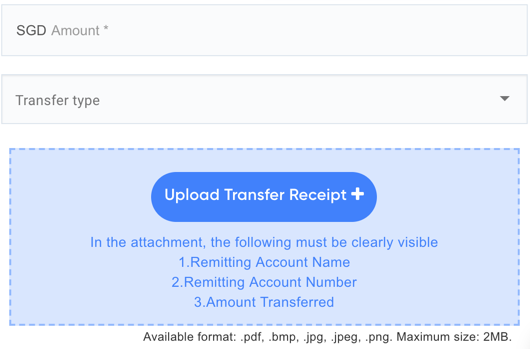 Enter the amount you have deposited, select the bank that it came from, the method of funds transfer and upload a screenshot of the receipt/deposit confirmation that should clearly show your bank account number and amount transferred. For deposits made before 11PM (SGT), it will be applied to your investor balance by noon the next business day. Otherwise, it will take 1 business day to confirm the deposit. Currently, we only accept deposits made through regular bank transfers such as internet banking. If you are making a deposit from an overseas bank account, we accept wire and telegraphic transfers too. At the moment, we do not accept deposits such as ATM transfers and PayNow. However, if you have already made the deposit from these methods, do send us the transaction receipt which clearly shows your name and the time of the transaction, so that we can investigate. You can reach out to us via the chat function or email (invest@fundingsocieties.com). Can a deposit be made from a joint bank account? Yes, we do accept deposits made from joint accounts. We process the transaction made by matching the name in the transaction to the investor's account name. Hence, you will have to login to your joint bank account with your name (the same name as on your Funding Societies account) to make the transaction, for us to place the deposit in the correct investor account. What should I do if I forgot to include my personal information when making the deposit? When making your deposit, do include your NRIC number if you are a Singaporean, or your passport number if you are a non-Singaporean. However, if you have forgotten to include this as a reference number, we will still be able to trace your transaction as long as it was made from a bank account under your name.